Modern web development technologies make this vacation rental software much better in customizability, scalability, security, and performance indexes. Two Native iOS app built in Objective-C separately – Each for the host and the guest. A dynamic and responsive admin panel to let you manage all your platform’s content, users, guests, hosts, services, properties, listings, revenue, and operations of the business. Detailed GUI to track all statistics thorough easily comprehensible reports. You can track the number of users, hosts, properties listed, commissions, reviews, and much more. The calculations are all automated. Hosts list their property with details and photographs on your platform. Rental software sends you a notification for the new listing for verification. Guests search for a property in the interested city and browse from the available options. Guests make payments mentioned by the host and some additional money as a transaction fee. The corresponding host approves the booking. Guest stays there and finally, the vacation rental script carries a pay-out to the host after deducting the commission. Charge commissions from the hosts upon every booking done through your platform. Charge a percentage cut of the booking amount as a transaction fee from the guests on every confirmed booking. The script and the mobile apps are completely white-labeled. They can be customized to entirely match your own branding specifications. The vacation rental software is entirely customizable to add any additional language pack in both the website and the mobile apps. In addition to the default payment gateways, the script/apps can be customized to support any local or global payment gateway of your area. We can integrate a CMS on your website to take advantage of the content marketing benefits and grow your business locally and globally. Guest-to-host and vice versa messaging system for a seamless communication channel and guided customer experience on the platform. Allow only verified hosts to list their properties on the platform after they authenticate their ID proofs. It helps to keep out spam and bad listings. Help your customers choose the best listing in an area through a guided browsing experience via peer-to-peer review and rating system. The rental script has been designed to offer the best user experience, performance, page loading, and strain irrespective of the user base, files size, and posted properties. Let your users link their social media accounts and enjoy a quick sign up/ sign-in anytime without registering a user account manually. Just like any public user platform, this vacation rental software is also equipped with a powerful system to lets users report other users, and admin to track, inspect, and block them accordingly. We know how important is content for a web-based business these days. That’s why we have made our CMS competent to manage any amount of website content in the best possible way. Dedicated mobile apps for all users to give them an easier, flexible, and optimized user experience while doing their activities on mobile phones. We that good URL structure is easy to read and are favored by search engines for ranking. That’s why the script follows SEO-friendly URLs to make that happen easily. 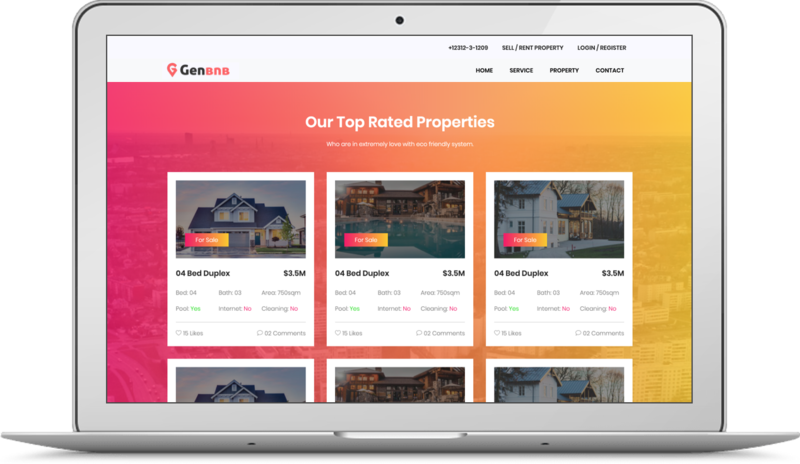 Why should you choose GenBnb? Our vacation rental script is available with open-source-code access. With a one-time payment, you can own this software for good. Forget all those recurring subscription costs and have complete control over your website and mobile apps with this unique vacation rental script. Being open-source code makes our script highly customizable to add new features, remove unwanted features, and revamp the look and feel to adopt your brand. Shape your website the way you want and take complete ownership of all your touchpoints. We will help you to install and set up the script & mobile apps for free. You don’t have to worry about the deployments even if you are not a coder. We have got everything covered for you. Purchase, configure and grow your business today with our easy support.